Some have asked me how to cook hot dogs in different ways. I can understand why I am asked this question. Hot dogs are a very cheap way to feed a family and kids seem to love them. 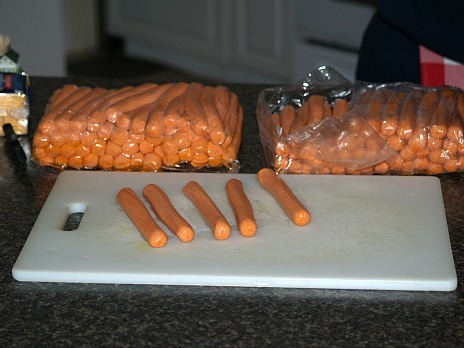 I purchased one hundred hot dogs from the local butcher for only $25.00; that is twenty five cents for each. These are good quality, nice size and great tasting. What else can you buy for this amount of money? Of course, everyone knows how to cook hot dogs by boiling them in hot water and serving on buns with catsup or mustard. There are many more ways to serve them than on buns. 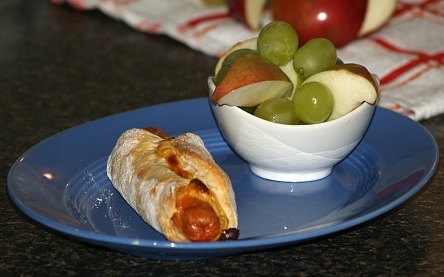 Kids might think the best hotdog recipe is what we call pigs in the blanket or dogs in the blanket. This recipe is great for breakfast, lunch or even dinner. Serve a little fruit with them, fresh salad, French fries or other side items your family loves. When I am asked for my best hot dog recipe from people wanting to know how to cook hot dogs, I can think of many. I would say one of my best hot dog recipes is what I call “cheap man’s stuffed crown roast” recipe; standing hot dogs are stuffed with mashed potatoes and surrounded with buttered carrots. This is a delicious combination! Run a large needle with thick thread through the hot dogs ½ inch from the bottom; leave extra string at both sides. Do the same ½ inch from the top. NOTE: At this point I place hot dogs on griddle to heat. You can wait until finished arranging and place the crown roast in the oven at 375F degrees for 20 minutes. Tie the ends of the top strings together; tie the ends of the bottom strings together to make a circle. 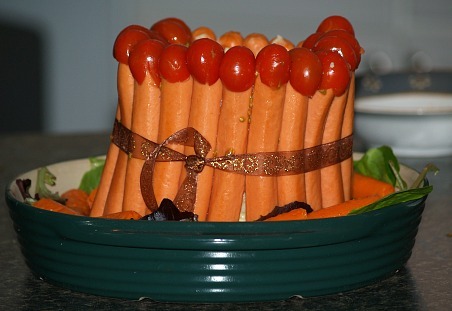 Stand the ring of hot dogs upright on a heatproof platter; tie a ribbon or string around the center. Fill the “crown” with mashed potatoes (or stuffing); garnish around the sides with cooked carrots. NOTE: If you want to spend a little more money, the larger fat frankfurters with a natural curve work quite well. Most of us love hot dogs and baked beans that is why so many cans of “Beanie Weenies” are sold. 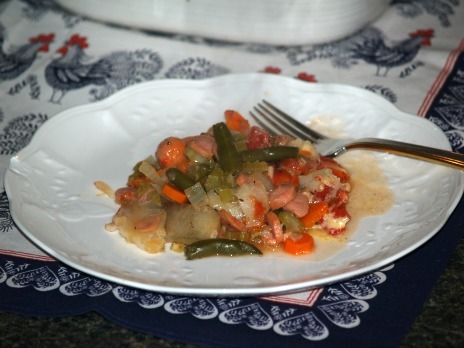 When learning how to cook hot dogs you will find they add a lot of flavor to casserole recipes. The casserole below is along the same line but much more delicious. Try it for a take in supper. 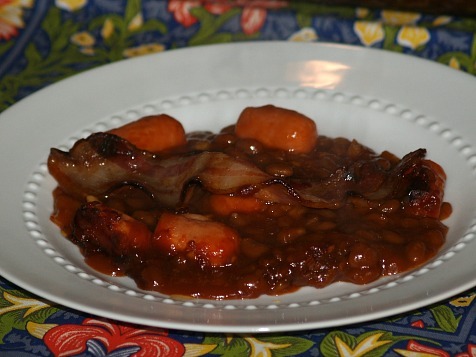 Combine all ingredients EXCEPT bacon strips; blend together and spoon into a greased casserole dish. 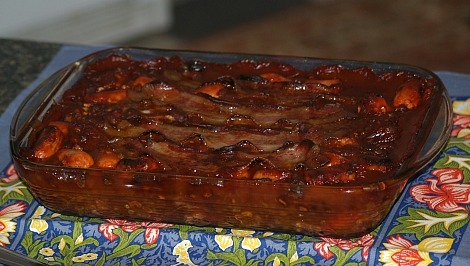 Top casserole with bacon strips; bake about 70 minutes. Preheat oven to 400F degrees; coat a large casserole dish with oil. Layer half of potatoes, carrots, celery, onion and green beans; top with half of hot dogs. Sprinkle with half of the seasonings; repeat the layers. Top with tomatoes with chilies; cover and bake at 400F degrees for 20 minutes. REDUCE oven temperature to 350F degrees; bake 1 hour longer until vegetables are tender. 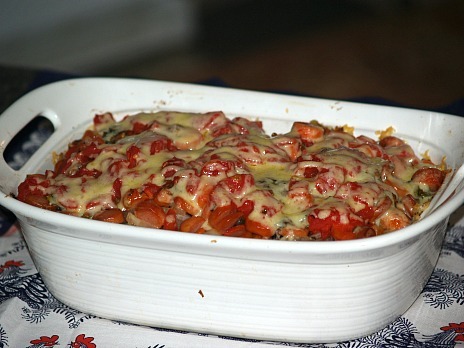 Top with cheese and place in oven until cheese melts; serve hot. When learning how to cook hot dogs you will find them a great alternative when making tacos. The flavor is excellent! In medium bowl combine taco sauce, cheese, onion and chilies. Split hot dogs lengthwise (Not all the way through; only so you can open them) place in shells. Stuff the hot dogs with ¾ of the stuffing mixture; stand upright in a 7 X11 inch baking dish. Top with remaining cheese mixture; place in oven or microwave until thoroughly heated. Serve topped with lettuce, beans and guacamole sauce. When learning how to cook hot dogs you will find many of the recipes very quick and easy to make like this one. Sauté frankfurters in hot oil`3 to 4 minutes; drain on paper towels. 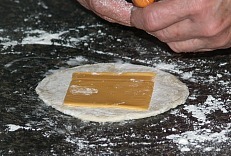 Separate dough into 4 rectangles; press each to an 8 X 6 inch rectangle. Brush edges of rectangle with beaten egg; add 1 sautéed frankfurter on each dough rectangle. Add about 1/3 cup of the beans to each; fold dough over hot dogs and beans and press edges to seal. Place bundles on greased baking sheet; brush each with beaten egg and sprinkle with cheese. Place in oven for 20 minutes or until golden brown. When learning how to cook hot dogs, you will find they come in handy for many easy appetizer recipes. Quite often they will taste completely different only by changing the sauce. Preheat oven to 350F degrees; arrange hot dogs in baking dish. Lightly brown onion in skillet with hot fat; add remaining ingredients and simmer for 30 minutes. Pour sauce over the hot dogs in baking dish; bake about 45 minutes. This recipe is about enough for 6; if you are having a party you might want to double or triple the recipe. For decades when learning how to cook hot dogs, one of the most popular hot dog recipes is called Pigs in the Blanket or I sometimes call it Dogs in the Blanket. The recipe takes UNBAKED BISCUITS, SLICED AMERICAN CHEESE AND HOT DOGS. Blend all ingredients together until smooth; roll dough out and cut in rounds like making biscuits. Then roll each round to about a 5 inch round circle. Place a slice of cheese on top of the dough and a hot dog on top of the cheese. Roll the dough and cheese over the hot dog; stick with a toothpick to hold closed. Bake in the oven until the dough is light brown; remove from oven and serve hot. Learn how to cook hot dogs by making deep frying corn dogs. Combine first 8 ingredients in large bowl; make well in center. Combine egg and milk; add to cornmeal mixture stirring until well blended. Insert 6 inch skewer in end of each hot dog leaving a 2-3 inch handle. In heavy pan heat 3-4 inches of oil to 375F degree. Dip each hot dog into batter and fry until browned 2 to 3 minutes. NOTE: Do not over crowd in pan. Drain on paper towels; serve with mustard and ketchup. Learn how to cook hot dogs to serve for appetizers. Cut hot dogs in ½ inch slices and place in saucepan or skillet. Combine and mix remaining ingredients; pour over the slices. Bring to a simmer and cook over very low heat for 45 to 60 minutes. Learn how to cook hot dogs in bite size pieces. Cut hot dogs in 1 inch pieces; heat butter in skillet. Stir in the bitters, onion salt and celery salt, add hot dogs and toss. Cook over medium heat stirring occasionally until pieces are brown and crusty. Spear with toothpicks and serve hot; makes about 40 bites. Learn how to cook hot dogs that are easy and delicious. Melt jelly in saucepan over medium; stir in the mustard. Cut hot dogs in 1 inch pieces; add to jelly mixture and mix. Bring to a boil and cook about 10 minutes; serve hot. Separate refrigerator rolls into triangles; cut in half making long thin triangles. Combine butter, curry, dill and mustard; spread thinly on surface of triangles. Place a cocktail frank on triangle on broad end; roll up to pointed end. Place rolls on UNgreased baking sheet; bake for 10 minutes and serve. Learn how to cook hot dogs “fit for a king”. Melt butter in skillet over medium high; sauté onion until tender and set aside. Roll pastry to 14X12 inch rectangle on lightly floured surface. Cut pastry into 4 (7X6 inches) rectangles. Bush each rectangle with mustard to ½ inch of borders. Place hot dog lengthwise on edge of each rectangle. Top each hot dog with ¼ of the onion, cheese and bacon. Roll (Jelly roll style) pastry around hot dog and toppings. Moisten edge of pastry with water and press to seal. Bake 20 to 25 minutes until browned; serve immediately.